Night Owl runs a regular feature called "Awesome Night Cards" on his blog. 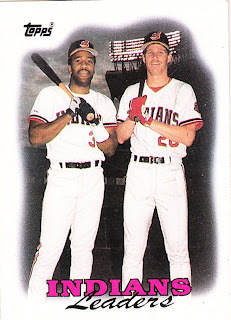 Number 105 turns out to be the 1988 Topps Indians Leaders card featuring Joe Carter and Cory Snyder. And while the card itself is worthy of a Night Owl post (who specializes in night-time sports cards), what transpires in his post covers the really, REALLY bad years of Cleveland baseball. Well, more than that, it is about the broken promise of a breakout season.